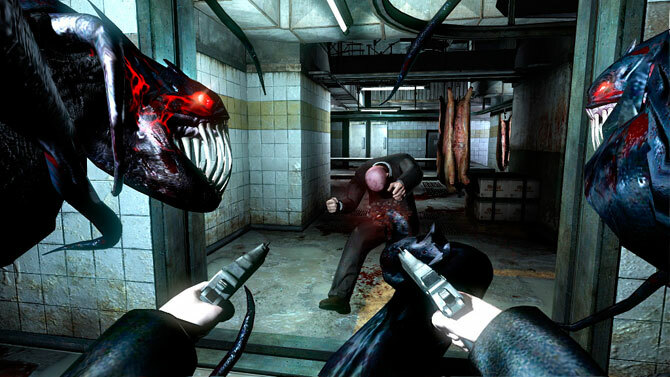 Its 2012 and if you still haven’t heard or played the Darkness, you’re missing out on a good game. All you console gamers looking to play something different from the mainstream games these days, This might just be what you’re looking for. If you’re wondering what this has to do with Mila Kunis, well don’t bother. I believe she deserves more attention than many others in terms of both talent and good looks. 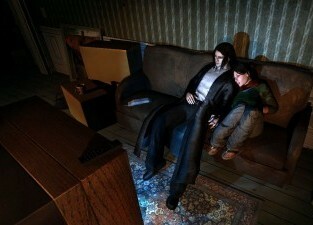 Story – Jackie Estacado has come a long way since his childhood at an orphanage. Gunning for New York’s Paulie Franchetti, he’s a made man of the NY Mafia. Same old mafia story? Listen up!! On his 21st birthday, he finds himself in a big mess. He’s being hunted by Paulie, who’s got Eddie Shorte of the NYPD hunting Jackie down. Not the way someone wants to celebrate their birthday. At least Jackie gets to cut a birthday cake and spends time with Jenny, who plays the love of Jackie. While Jackie’s getting to explore an unearthly power and hearing this weird voice within, Jenny gets kidnapped by Paulie and Eddie. They murder her in front of her lover in the same orphanage they grew up together, but he’s forced to watch the bad guys shoot her and escape. With nothing else left to lose, Jackie puts a bullet to this throat. Little does he expect a tour of the ‘Otherworld’ to find out about his past that his family’s .He realizes that he is heir of a dark, unholy power – the Darkness, voiced perfectly by lead singer of Tomahawk. He’s instructed by his World War veteran great-great-grandfather in the otherworld on how he can get rid of the dark force but before he can do much, Jackie wakes up in the real world. Guns and Tentacles. Any problem? With his new found power, Jackie comes back full force. Vengeance is on the menu and it’s fresh out of the freezer. He blows his Uncles drug business and bombs the corrupt cop getting K.I.A – “That’s the 2nd time I died.” He’s back to the other world where he’s now fighting the darkness with his grandpa. He loses his him but carries on to hunt and defeat the darkness. He reaches the place where the core of the darkness resides and instead of destroying it, he embraces it. He is warned that the more he kills, the more he will be consumed by the Darkness. Jackie comes back to the real world and in the final battle kills Paulie. With the final kill, Jackie is completely devoured by the Darkness. The ending of the game is painfully emotive as Jackie gets to spend a few final moments with Jenny. Gameplay– You could think of The Darkness as a mash up of Return to Castle Wolfenstein and Call of Juarez with a Maxpayne-ish feel. The cross hair is very annoying. I’m a PC guy and I’ve found playing an FPS on a console a big challenge. There are lots and lots of weapons to choose from. However, once you get the darkness powers, you care less about the arsenal. Jackie gets 2 tentacles coupled with his arms so you’re throwing people around and cracking skulls with guns simultaneously. Somehow I felt that the player didn’t have equal control over both tentacles. Jackie never really sprints which makes the game feel slower that what it should be. No health meter here and once you get the darkness guns, no worrying about ammo as well. Light is Jackie’s only weakness so there’s a lot of shooting to do. Spawning minions, each with specialized abilities is another added advantage that makes the game a cake. The AI hardly puts up any challenge as game offers little freedom outside the main story, in the form of mini games, so you stay on track.The multiplayer version of the game didn’t appeal to me. You get to play capture the flag competitions which frankly I didn’t want to waste my time playing using a controller. Given a mouse, may be I would’ve considered checking it out a while. NY is a big city right?? It’ll never seem more confined. On the other hand, there are lot of emotional elements in this game that will drive you to get to the end. Graphics – For a 2007 game, It looks great. There are some scenes that will feel awkward and some that will feel awesome. Jenny lying on your shoulder with her arms wrapped around Jackie sets a very romantic mood while the otherworld is a world war-like battle zone. The story is very comprehensive as you go back to Jackie and Jenny’s childhood at the St. Mary’s orphanage. Characters up close look very sketchy and the tentacle movements seems out of control now and then. The game somewhat seems a dull in terms of the setting, but you don’t want all flashy disco lights and sunny days in a horror game.do you? There’s that odd glitch here and there so 3.5 out of 5. In certain parts of the game, you get to play as the darkling. Audio – Music and voice acting is a very important aspect in horror games and the guys at Starbreeze nailed it. Mike Patton as the voice of the Darkness is awesome while other characters play their designated part. I have to admit though, a couple of times, Jenny sounds like a man.Initially, Jackie behaves like the guy from GTA 3 who never talks. Later he becomes Tommy Vercetti with a strong mafia accent. Not very pleasing. Bonus content – you find phone numbers all across NY and can be dialed at a payphone to unlock a collectible. Back in the otherworld, its letters you need to collect. Many in game achievements, darkling costumes to be unlocked. Sitting with Jenny on her couch, you could choose to watch the entire 2 hours of To Kill a Mockingbird. There seem to be other full length movies you can watch.Wonder who would want to though. 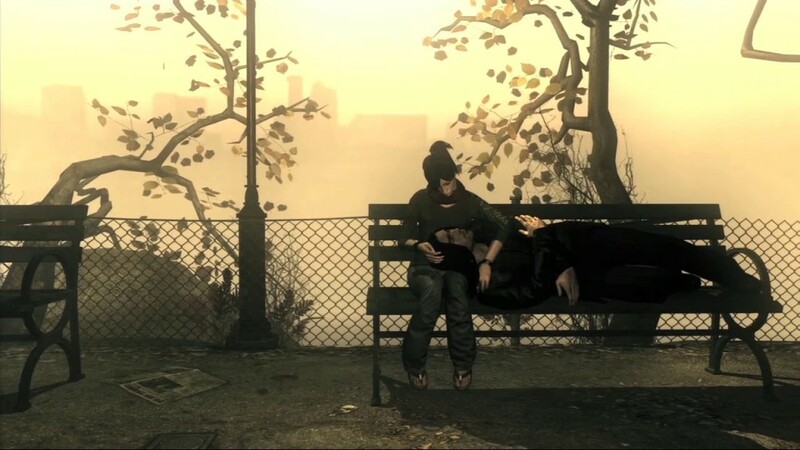 One of the most romantic scenes in a game…ever. The game is a must play for its story and the mafia-horror fusion. If you play it today, you’re going to ask why didn’t this game get the attention it needed? Strong language and all the blood n’ gore got it an M rating. There are certain moments it’ll give you those sudden starts that’ll make you jump out of your seat in fear but its only at the start of the game. The emotional plot did me in. 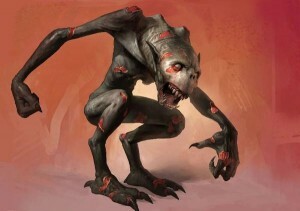 If you’re done with all these modern FPS’s and are looking for creeps, The Darkness is waiting to be played. Jack of many trades - Masters in Software Engineering. I'm a picky gamer. I'm a picky human being. Apart from playing video games, I have a flair for writing, over complicating life, cooking spicy Indian/experimental cuisine and a general research interest in things.